Is There a Railroad Surgeon in the House? I have just stumbled across an obscure and wonderful book, thanks the to efforts of Google to digitize the world's printed material. 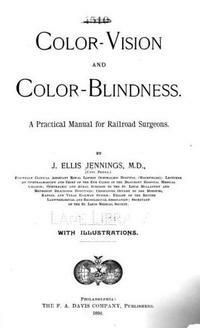 It's the 1895 edition of Color-vision and Color-blindness: A Practical Manual for Railroad Surgeons by J. Ellis Jennings, MD. The title alone evokes all kinds of thoughts. Who knew there were such things as railroad surgeons? They must have been the precursor to flight surgeons. And who knew that color-blindness was such a problem in the railroads that not just a manual was required on the market, but a practical manual (no esoteric manual for me, thank you very much). "In 1875 a serious railway accident occurred in Sweden, which intensely excited public attention. At the investigation which followed it was found that colorblindness was one of the principal causes of the disaster." You'll enjoy Jenning's history of color-blindness, the evolution of detecting color-blindness among railroaders, and the descriptions of the color blind tests used at the time. My favorite? Here's a picture of Thomson's Stick. Yep, that's the official name of the test. It's a "stick." Just because you're colorblind doesn't mean you can't do beautiful things with color. I've pointed out colorblind artists before, but perhaps it's the cuttlefish that takes the prize for utilizing color while not being able to see any at all. Okay, cuttlefish aren't human, they're cephalopods (examples of cephalopods are squids, octopus), but once you see their talents you'll certainly agree they are artists. Take a look at the cuttlefish's amazing ability in this clip. Remember, cuttlefish can see no color. Not that I intend to discount the many moods of Tombi, but in my book the cuttlefish has the use-of-color talent nailed over the rest of the animal kingdom. Link: How to simulate colorblindness at ColorJack (via Using canvas to test your site with colorblind folk). Link: BIZOnline - Pair giving colour-blind a new vision. Are We Ready To See Colors That Have Never Been Seen Before? It turns out, thanks the power of genetic manipulation, that everyone may be colorblind since there are some colors that no one has ever seen. Yet. Giving New Meaning to the Term "Blind Review"
Suppose you're a scientist. Suppose you write papers and proposals that are reviewed by your peers. Suppose your paper is reviewed by three white males (not impossible). What's the probability that one of the reviewers is colorblind? According to Masataka Okabe and Kei Ito, the answer is 22%. [ 22% = 1-(1-0.92)^3 ]. If that's not enough to scare you into making figures and presentations that are friendly to colorblind people, maybe this will: In any room of 250 or more people there are probably at least ten people who are colorblind. These demographics are, in part, why Okabe and Ito have authored a sensible guide on how to select colors and graphics that are unambiguous to both colorblinds and non-colorblinds. While their essay is aimed at improving the lot of work created by authors in the ivory tower, their points should be heeded by scribblers of all ilk. Advice to not use a combination of red and green. They suggest using magenta instead of red, which really works. In the two images above, the top image contains red that is very difficult to distinguish from the green when viewed by those with red-green colorblindness. Conversely, when the authors present the same image with magenta substituted for red, distinguishing the two colors becomes no problem for those with red-green colorblindness. For graphs and line drawings, Okabe and Ito suggest labeling elements of the graph on the graph itself rather than making a separate color-coded key. For those who are colorblind, matching the same colors in different places on a chart is extremely difficult. I can confirm this from experience. Red is not necessarily a bright color and does not stand out well against black or green. To their credit, Okabe and Ito have created a PowerPoint slide version of their article. It contains all the key points and tips. Unfortunately, the slide show could benefit from a touch of design. Too bad they haven't met Garr Reynolds or Cliff Atkinson. Link: Colorblind Barrier Free: How to make figures and presentations that are friendly to colorblind people. I stumbled upon an interesting post by Alexia Golez, a self-proclaimed “geek” from Ireland. Seems that a yearly Science & Technology exhibit called the BT Young Scientist Exhibit (YSE) 2008 is currently ongoing, and the young Irish scientists have some quite impressive projects and prototypes on show. Two of these young scientists include Adam Kielthy and Conor Scully, both from Sutton Park School. Their project was a Web Browser for the Colour Blind, and it tackled changing the approach to interpreting web content. As noted in a previous post, over 101 million of the world’s netizens are color blind, and improving the accessibility for these individuals would be praiseworthy. These days when brick-and-mortar establishments are no longer the only way to go, and when college degrees are no longer the only ticket to a good career, it’s heartening to see bright young individuals like Adam and Conor coming up with solutions that elude scientists many years their senior. We’ll be keeping our eyes on them in the years to come. Bear with me. You won't regret it. I want to talk about synesthesia for a sec. For instance, there is a form of synesthesia called "grapheme" where letters or numbers are perceived as always being a certain color. The color associated with the letter or number varies from person to person experiencing the sensation. The image above is representative of how someone with synesthesia might perceive certain letters and numbers. In other words, this person could see colors he wasn't supposed to be able to see. He could "cross-activate" his brain and fire up the perception of a color his retinas weren't equipped to process. Link: More Common Questions about Synesthesia: Scientific American.